Fermentation, one of the oldest forms of food processing, is suddenly trendy. 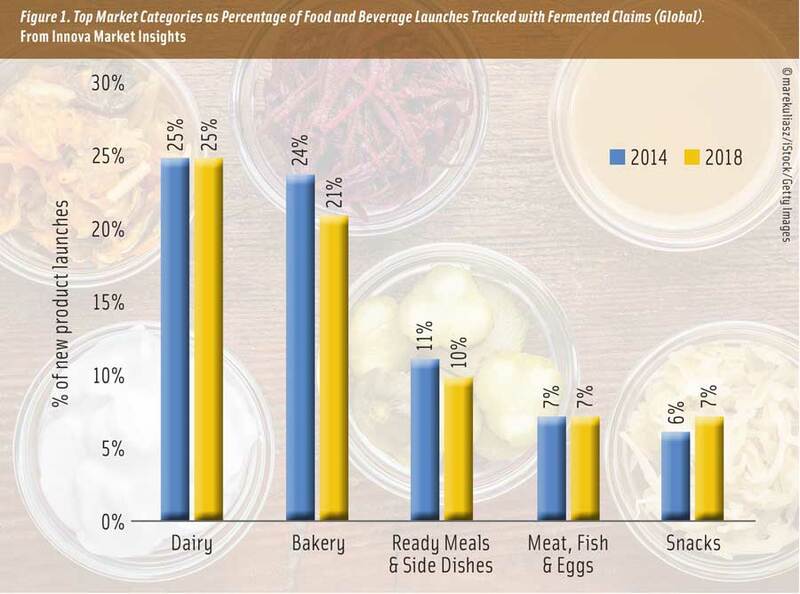 The average annual global growth of food and beverage launches tracked with fermented claims is 11% for the period from 2014 to 2018, according to Innova Market Insights. What’s more, Innova’s analysts note that products featuring fermented claims can be found in a wide range of categories. Some include confections like gummy candy, beverages such as milk/juice blends, and snacks like biscuits. At the 2019 Winter Fancy Food Show, members of the Specialty Food Association trend spotters panel found a number of companies promoting fermented products such as Jalapeño Fermented Honey Sauce from Anya’s Apothekere; Q-Soo Sparkling Fruit Tonic, a fruit-infused drinking vinegar (shrub) and sparkling water from Purely LLC; and El Curtido, a Central American-style condiment from Wild West Ferments (Specialty Food 2019). Fermented foods and beverages were probably among the first “processed” foods that humans consumed, writes Robert W. Hutkins in Microbiology and Technology of Fermented Foods (2019). He also notes “the means for producing so many fermented foods appears to have evolved independently on every continent and on an entirely empirical basis.” Fermentation is a traditional food processing technique that has been used for centuries to preserve foods and make food safe, and in recent years, consumers have learned a lot more about how food is made and how fermentation works, says Kara Nielsen, vice president of trends and marketing at CCD Helmsman. This has helped to spur interest in this age-old process. Sourdough bread, cheese, soy sauce, yogurt, coffee, tea, sauerkraut, vinegar, and kimchi are some of the traditionally fermented foods. Many cuisines around the world have their own quintessential fermented foods (think kimchi, a traditional pungent Korean side dish made from fermented vegetables like Napa cabbage and daikon radish; kvass, a Slavic fermented grain beverage made from rye bread; and skyr, a strained cultured cheese product from Iceland that has the texture and tangy flavor of Greek yogurt). Millennials are more willing to try new international cuisines and flavors, making this another contributor to the popularity of fermented foods and beverages, says Mindi McKibbin, principal scientist of beverages at DuPont Nutrition & Health. Chefs, too, understand the appeal of fermented foods and ingredients. For example, chefs René Redzepi and David Zilber of famed restaurant Noma have developed every dish served at the restaurant to include some type of fermented component. Additionally, Redzepi and Zilber opened a fermentation lab adjacent to the restaurant where they develop a substantial range of ferments. Let’s take a closer look at what’s driving the popularity of fermented foods and beverages, and what that means for product developers. In addition to Innova Market Insights’ data showing an increase in the overall number of new fermented food and beverage products hitting the market, the company notes specific products and ingredients trending in this area, with dairy, in particular, leading the charge. Dairy tracked as the top market category with fermented claims; the percentage of global new dairy product launches with fermented claims was 25% in 2018, according to Innova Market Insights. The popularity of fermented dairy products—everything from yogurt, cultured sour cream, and buttermilk to kefir, skyr, and koumiss—makes sense in a way. Fermented milk is one of the oldest of all fermented foods, and milk is a fitting substrate for fermentation since it is a high source of carbohydrates and nutrients, according to Hutkins. Within the dairy area, kefir products are the ones to watch, as Innova data show that launches of kefir have a compound annual growth rate of 19% during the period from 2014 to 2018. The dairy category is followed closely by bakery with 21% of launches. Three others round out the five categories that Innova tracked, although the numbers are much lower: ready meals and side dishes (10%), meat, fish, and eggs (7%), and snacks (7%). The low number of fermented product launches for snacks doesn’t tell the entire story of what is going on with that category though. It turns out that it is one of the fastest-growing market categories with fermented claims, with a compound annual growth rate of 14% in the 2014–2018 time frame, according to Innova. Others include soft drinks (26%), hot drinks (25%), sports nutrition (21%), and alcoholic beverages (21%). Fermented foods—everything from the refreshing fermented tea beverage kombucha to the salty, savory pastes miso and gochujang—have several properties that contribute to their popularity. Consumers now recognize fermentation as a long-standing, natural process that can produce foods that often have health benefits, says Nielsen. One of the top five claims on fermented food and beverage products is digestive/gut health, according to Innova Market Insights. Consumers are also exposed to a wider variety of lacto-fermented vegetable products in the chilled cases in the perimeter of grocery stores. Even though they are fermented, the fact that they are in the chilled cases points to freshness, a quality of greater importance to many consumers, says Nielsen. Lastly, consumers also enjoy trying new foods and flavors, and fermented foods have unique tastes and flavors due to the free amino acids and free nucleotides formed during fermentation. This can range from the savory and umami flavors of fish sauce and soy sauce to the tangy flavor of kefir and cultured dairy products to puckery tart and sour flavors of vinegar and fermented vegetables. In her work analyzing culinary and food product trends, Nielsen has noticed the importance of flavor and how fermented foods—with their wide variety of savory, salty, tangy, and sour tastes—can be used to create a well-layered flavor profile in finished applications. This is part of a larger push to create multisensory, delicious flavor combinations across all food eating experiences, and there’s no easier way to do this than with sauces and condiments. For example, there is an interest in bringing different elements to what we eat by using fermented foods as condiments or ingredients, says Nielsen. Take a grain bowl, salad, or rice bowl and mix in a fermented sauce product or top it with a fermented vegetable to give it a tanginess and slightly sour taste, she suggests. Another example she gives is using miso to add flavor depth and to balance the sweetness of caramel sauces and sweet baked goods like brownies. Adding small amounts of fish sauce or soy sauce to sauces, soups, dressings, and other similar applications provides salty flavor and perks up umami flavor. Sauces, condiments, and seasonings are applications in which fermented foods can shine. 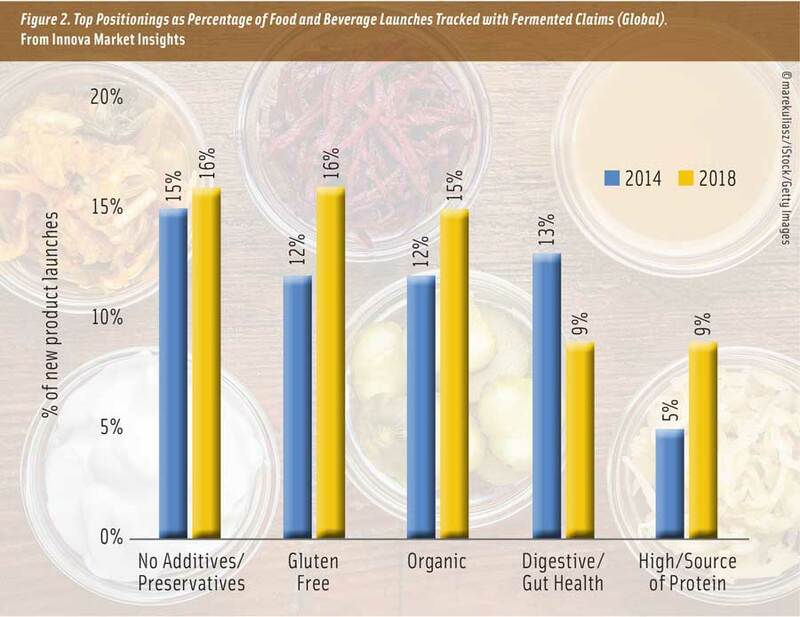 The market penetration of new sauces and seasonings launches tracked with fermented claims is 6%, and it is a category that is a growth area for fermented claims, according to Innova Market Insights. Nielsen sees opportunity in these categories, too. Some of the fermented foods can be used as ingredients to formulate new versions of condiments. As examples, she noted spicy kimchi aioli, kimchi salsa, potato chips flavored with apple cider vinegar, and sauerkraut craft beer mustard products. Another area to explore is that of fermented and pickled fruit condiments, which can be used in salads and in bowl applications, and as toppings for meat dishes, says Nielsen. Perhaps pair turkey with fermented cranberries or some type of pickled fruits relish with hot dogs, she suggests. In recent years, there’s been a convergence of both the fermented food trend and plant-based eating trend, resulting in some interesting research being conducted on fermented plant-based ingredients and development of fermented products formulated with them. Overall plant-based eating trends are driving new product developments across different food and beverage categories. Plant-based product claims increased by 62% globally (CAGR, 2013–2017), with plant proteins being one of a few plant-based ingredient categories contributing to this growth (Innova 2018). One category of interest is in dairy alternative foods and beverages. A consumer survey commissioned by Chr. Hansen examined attitudes toward dairy alternative products and found that more than half of the consumers surveyed have purchased a dairy alternative food or beverage, and among those, 77% want to see more options in stores (Chr. Hansen 2017). Pair this information with the increase in fermented claims on products across categories and it becomes clear why product developers are exploring the area of fermented plant-based products. “In addition to consuming more fermented products, consumers are also looking for more plant-based options, which opens opportunities for plant-based yogurt alternatives and fermented beverages,” says McKibbin. Some of these products, such as plant-based or vegan yogurts made with soy or coconut and beverages made from fermented soy or almonds, are being sold in grocery stores and online. Keyword searches turn up troves of recipes for home chefs to make their own fermented plant-based foods and beverages from such plant-based ingredients as soy, nuts, beans, and peas. The topic is also of interest to researchers, who are conducting studies on various fermented plant-based ingredients and their potential use in product applications. Some recently published studies have focused on fermented oat beverages (Gupta and Bajaj 2017; Angelov et al. 2018), corn-based yogurt (Wang et al. 2017), fermented almond milk (Bernat et al. 2015), fermented chickpea and faba bean flour (Chandra-Hioe et al. 2016), and a fermented quinoa-based beverage (Ludena Urquizo et al. 2017). Ingredient developers specializing in fermentation offer cultures to help food manufacturers develop plant-based yogurts and fermented beverages for consumers looking for alternatives to dairy. Chr. Hansen offers two YoFlex cultures for plant-based yogurt that play a key role in ensuring that the plant-based yogurt formulated with the ingredient has suitable taste and texture comparable to traditional yogurt. YoFlex YF-L01 DA is a blend of two Streptococcus thermophilus strains that can speed up the acidification of the plant base and give a mild and fresh fermented taste while YoFlex YF-L02 DA is a blend of several strains that play roles in flavor and texture. The Danisco VEGE cultures come in a freeze-dried format, which allows for a consistent dosing of the culture batch-to-batch in a customer’s production process, says McKibbin. The cultures remain stable at refrigeration temperatures and this can help to reduce the high costs of transportation and handling associated with frozen. Next month’s Ingredients section will provide a preview of some of the ingredient suppliers exhibiting at IFT19 in New Orleans (expo dates: June 3–5). For many centuries, fermented foods like cheese, yogurt, and kefir have relied on lactic acid bacteria for their flavor, nutrition, texture, and shelf life. The art of fermentation has now become a science through genomic sequencing of lactic acid bacteria, which has improved the stability of the fermentation process and yielded insights into the probiotic properties of fermented foods and their interaction with the human gut and microbiome. Listen in on an insightful discussion moderated by E. Allen Foegeding with guests Todd Klaenhammer, William Neal Reynolds Distinguished Professor of Food Science, Microbiology, and Genetics in the College of Agriculture and Life Sciences at North Carolina State University, and Rodolphe Barrangou, professor in the Department of Food, Bioprocessing, and Nutrition Sciences at North Carolina State University. To access the IFTNEXT podcast, “The Genomics of Lactic Acid Bacteria: From Fermentation and Probiotics to the Microbiome and CRISPR,” visit www.ift.org/IFTNEXT/The-Genomics-of-Lactic-Acid-Bacteria.aspx. Members Only: Read more about fermentation and fermented foods and beverages at ift.org. Type the keywords into the search box at the upper right side of the home page. Angelov, A., T. Yaneva-Marinova, and V. J. Gotcheva. 2018. “Oats as a Matrix of Choice for Developing Fermented Functional Beverages.” J. Food Sci. Technol. 55: 2351. Bernat, N., M. Cháfer, A. Chiralt, and C. González-Martinez. 2015. “Development of a Non-dairy Probiotic Fermented Product Based on Almond Milk and Inulin.” Food Sci. Technol. Int. 21(6): 440–453. Chandra-Hioe, M. V., C. H. M. Wong, and J. Arcot. 2016. “The Potential Use of Fermented Chickpea and Faba Bean Flour as Food Ingredients.” J. Plant Foods Hum. Nutr. 71(1): 90–95. Chr. Hansen. 2017. “Want to Embark on a New Adventure in Plant Based Products?” Press release, Sept. 29. Chr. Hansen, Hørsholm, Denmark. chr-hansen.com. Gupta, M., and B. K. Bajaj. 2017. “Development of Fermented Oat Flour Beverage as a Potential Probiotic Vehicle.” Food Bioscience 20: 104–109. Hutkins, R. W. 2019. Microbiology and Technology of Fermented Foods, 2nd ed. IFT Press book series. Hoboken, N.J.: John Wiley & Sons Inc.
Innova. 2018. “Green Eating Driving Plant-based Innovation.” Press release, July 9. Innova Market Insights, Arnhem, the Netherlands. innovamarketinsights.com. Ludena Urquizo, F. E., S. M. Garcia Torres, T. Tolonen, et al. “Development of a Fermented Quinoa-based Beverage.” Food Sci. Nutr. 5: 602–608. Specialty Food. 2019. “Specialty Food Association Trendspotters Reveal Winter Fancy Food Show Trends.” Press release, Jan. 31. Specialty Food Association, New York. specialtyfood.com. Wang, C., H. Zheng, T. Liu, D. Wang, and M. Guo; 2017. “Physiochemical Properties and Probiotic Survivability of Symbiotic Corn-Based Yogurt-Like Product,” J. Food Sci. 82(9): 2142–2150.